Attached is a document written by Dr. Jeffrey Demain, a prominent allergy and immunologist in Anchorage. It was taken from the Asthma and Allergy Foundation of America, Alaska chapter newsletter. The document discusses how to deal with seasonal allergy symptoms. It has some great information even for those may not have been diagnosed with chronic allergies, but have intermittent symptoms. Studies say that 20% of the population suffers from seasonal allergies, however, from my experience, I would say that number is greater in Alaska. Please read the information, especially if you suffer from seasonal allergy symptoms. The information is very thorough. 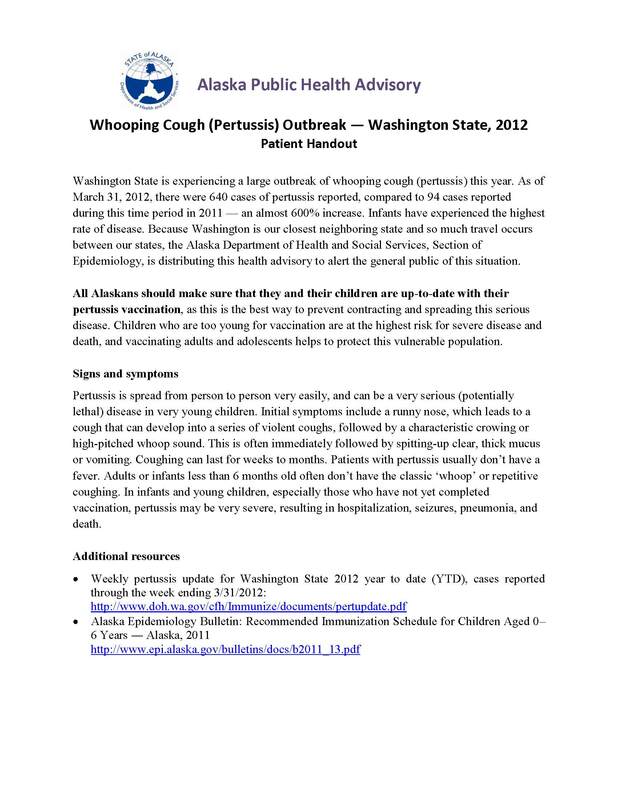 Included is the link for up-to-date pollen information for Alaska which is at www.allergyalaska.com. Thank you for the Cup of Noodles, other food contributions and the many great things you do for this wonderful school. There have been many hungry Steller students who made it through the remainder of the school day thanks to your generosity. Have a great summer and be safe! Millions of Americans are keeping their tissue boxes close by in preparation for the peak of the spring allergy season. The budding trees and blooming flowers associated with the return of spring mark an increase in itchy, watery eyes, sneezing and other allergy symptoms. One of the best ways to help prevent allergy attacks is to start taking medication prescribed by your allergist about a week before peak allergy season in your area begins. With continued use of medication and avoidance of potential triggers, allergic symptoms can be minimized. Minimize outdoor activity when pollen counts are high. Peak pollen times are usually between 10 am and 4 pm. Get up-to-date pollen information for Alaska at www.allergyalaska.com. Take medications at least 30 minutes prior to outdoor activity. Consult with an allergist/immunologist to ensure medications are helping you and notify an allergist/immunologist when reactions to medications occur. Shut windows in your house on days pollen counts are high. Avoid using windows or fans that may draw pollen inside. When mowing lawn or doing gardening, wear a filter mask. If you are going through clothes this summer, please set aside nice looking sweats, tops and socks that can be used by students at Steller who get rips, have inappropriate attire, etc. We also need cups of noodles and other food items for those students who forget their lunch. Thank you so much for your donations. The students and I both appreciate your generosity. I sent immunization notices home for those students who will need vaccinations before registration in August. Please take care of this. The muni (343-4799), Prov. (212-4824) and Regional (276-1131) have free immunization clinics. If you chose, you can download registration forms from the ASD website. Having them filled out beforehand can save you a great deal of time at registration. Go to the ASD homepage and under parents/students click on forms. To the right you will see Back-to-School forms page. Nothing is there now, however, as the beginning of next school year approaches, there will be. You can also go under Department (on the homepage), click on Nursing/Health Svc. and then on the left side of the screen click on Health Forms. From there you can access the Health Services forms you will need. Students who may need an inhaler, epi pen, glucagon or diastat MUST have a care plan. A teacher can administer epinephrine on a field trip ONLY if I there is a care plan on file with me. Documentation in Zangle determines which schools receive a nurse if I am out of the building or if a nurse is needed on a field trip. Please complete the forms, obtain the health care provider’s signature and fax or bring them to registration. Students new to the district and all 7th graders need the PPD form as well. Thank you for your attention to these issues. Have a wonderful summer! I look forward to seeing you in August. We are out of Cup of Noodles in the nurse’s office. I appreciate the many generous donations from you parents who have been so gracious contributing food items. If other parents are so inclined, the kids could use another case of Cup of Noodles from Costco (or wherever) to tide them over until next year. I have reminded the “frequent fliers” who tell me that they do not have time to make lunch in the mornings that their lunch can be made the night before. Next year it looks like we’re going to have Souper Steller every Friday, so everyone will have a nutritional meal that day. Steller is excited about that! I am planning an educational study group for adolescent girls starting immediately after school April. 3rd. I prefer to just have girls so that there will be more participation and less socialization. This is a group strictly for fun. Consequently, I have chosen an interesting topic that everyone can benefit from. The group will focus on motivational styles. We will identify our motivational style by taking a short quiz, and then we will discuss what we found out and how we can use this information to motivate us as well as others. We will also talk about goal planning and related topics. The study group is based on a 2009 book entitled Get Motivated. Learning what most motivates us can help to facilitate success in school, careers, relationships and other areas of life. The book says we are motivated by drives, needs and values. The information is informative and entertaining. It is fun to find out about ourselves and learn how we can use that information. I will need a commitment from the group members to stay with the group until its completion (six weeks). It is disruptive to be present one week and not another. So, if as a student or the parent of a student, you feel this group could be beneficial please complete the attached form and return ASAP. I must have parental consent for participation. We will start immediately after school on April 3rd. The group will last about an hour and will meet every Tuesday for six weeks, ending May 8th. If you need more information, a detailed explanation of the group was posted on Flash back in February and you can always call me at 742-4963. Each year Steller conducts an educational program for the sophomore class. The emphasis is on issues related to sexuality. This is a full day workshop that features guest speakers from the community. The purpose of this event is to present students with current, accurate information. AIDS, HIV, STDs, internet safety, gender identity, drug and alcohol use and other related topics will be discussed. There will also be discussion of human anatomy and physiology, healthy relationships, responsible decision-making, etc. All sophomores are encouraged to attend. The importance of reinforcing information related to these adolescent issues cannot be over emphasized. Adolescents need to be provided with the facts to help them make the wisest decisions. This day will be an informative event where your adolescent will come away with increased knowledge of many difficult life issues. The attached consent for the workshop, signed by you, must be in the nurse’s hands by Wednesday April 11th. * Students will be excused from their regular classes. They must attend the full day, however, to be excused by the school for this event. An ASD bus will depart promptly at 8:40 and will return at 2:05 pm or shortly thereafter. All students are expected to ride the bus. Sophomore students must attend Sophomore Day if they plan to participate in Steller Activity night that evening. The Lions Club has agreed to come to Steller and perform a very sophisticated vision screening for students, faculty and any parent who is interested. ASD has purchased two of the machines that are to be used it is expected that this will become part of the routine ASD screening in the future. I have arranged for the Lions Club volunteers to show up Thursday, March 29th. They will be start screenings soon after 8:30. 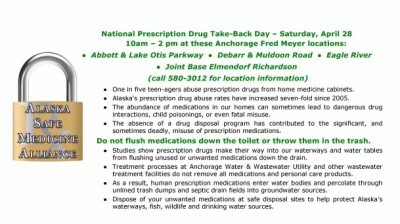 Please make certain your adolescent has his/her glasses on or contacts in that day. They will not be screened without them. I would also like a few parent volunteers to go to the classrooms and bring students down to the MPR. I want this to go as rapidly as possible so that students are not out of class longer than necessary. Since a similar screening is going to be routine with ASD and this is not an invasive procedure, no consent form required. A form will be sent home with the results. If a referral is necessary, the problem will be addressed on the form. You are highly encouraged to follow up with an optometrist or ophthalmologist. Recently a student in ASD was found to have a detached retina. If it had not been caught, the child likely would have lost vision in that eye. Please call me at 742-4963 if you have any questions. I am planning a psycho-educational study group for adolescent girls starting March 20th immediately after school. After talking with Steller students, I come to the conclusion that groups such as this have acquired the reputation of being for students who have “issues.” That is NOT the intent of this group at all. I want to dispel that belief. Consequently, I have chosen a fun topic that everyone can benefit from. The group will focus on motivational styles – how they can be applied to us, and others. Next year we can consider tackling more serious topics (dating, drugs, etc.). The proposed study group is based on a 2009 book entitled Get Motivated. If you are interested in finding out more go to www.getmotivatedbook.com or purchase the book. The initial activities will involve taking a short quiz designed to determine each participant’s motivational style. The author has over 20 years of research and personal experience working with thousands of people across the globe. Her book and motivational test are the results of this experience. Learning what most motivates us can help to facilitate success in school, careers, relationships and other areas of life. The information is both interesting and entertaining. It is fun to find out about ourselves and learn how we can use that information. In the group we will talk about different combinations of motivational styles, take the Motivational DNA test (drives, needs and values), share the information with others and talk about how we can use it. Through the seminars her company puts on, the author has gotten to know such renounced celebrities as Margaret Thatcher, Colin Powell, Ronald Reagan, Joe Montana, Mother Theresa, etc. She talks about their motivational styles, as well as what demotivates them. I will need a commitment from the group members to stay with the group until its completion (six weeks). It is disruptive to be present one week and not another. I also would also like the participants to become familiar with a more confidential group mode. This is a benign topic, however, with the intent of eventually having more serious groups, I will emphasize group rules such as confidentiality, i.e., “What is here, stays here.” We will go over group rules every session until the groups is familiar with them. If, as a student or the parent of a student, you feel this group could be beneficial, please complete the attached form and return ASAP. I must have parental consent for participation. The group will last from 45 minutes to an hour. We can start immediately after school on March 20th. The group will continue for a total of six weeks. I am receptive to your thoughts or concerns. Please contact me at 742-4963. I am still trying to recruit donors for the blood drive. I am hoping you will read this over the weekend and make arrangements to come to Steller during lunch or on the way home from work Friday, February 17th. This is a staff development day, so no students will be here except those who have generously agreed to donate blood. If one of those students is your adolescent, then please make certain they have provided me with a consent signed by you. We need 18 donors to make the drive worth the Blood Bank’s time. I am really proud of the students who have come forth and volunteered. Some have told me, “I have really looked forward to this.” That’s the Steller spirit! It is heartening to see what a positive influence other students have been on those who were underage and could not donate in the past. Again, the attached guideline says that a student must be at least 16 years old, have a signed parental consent on file with the nurse (if they are not 18 or older) and weight 113 pounds minimum. Let’s give the Blood Bank at least the minimum number of donations so that they will know they can depend on Steller each and every year. 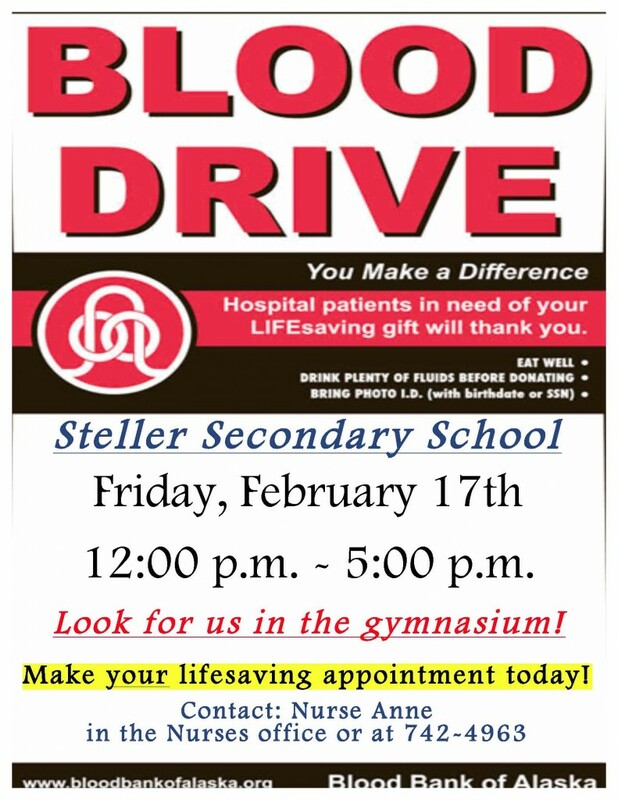 Steller is hosting a blood drive on February 17th from 12 pm until 5 pm in the gym. This is a no school day for students, however, students who don’t mind coming to school for a short while on that day can donate with parental consent (see attachment). Students must be at least 16 years old and weight a minimum of 113 pounds. Of course, 18 year olds do not need a parental consent. Parents, if you work close by, you could come by at lunchtime or leave work a little early. All donors will be asked to fill out a questionnaire before the blood draw. The procedure itself should not take anymore than 15 to 20 minutes. You will be given a snack afterward and then can be on your way. The Blood Bank needs at least 18 people to make the drive worth their time. If you and/or your adolescent, spouse, friend, neighbor, etc., is interested, please call (742-4963) and let me know what time. We will try to schedule the times so that you will not have to wait and so that we can make the best use of the blood bank staff’s time. You can call me anytime during the school day or leave a message on my voicemail after hours. I will return your call. Mitchell will take your calls in the main office as well (742-4950). Please spread the world. Since the parent-teacher conferences were changed to the end of the year, there just seemed to be too much going on to do it at that time. I did not want to disappoint the blood bank people and cancel the drive, so we will do our best to meet their quota on the 17th. Thank you for your help with this. An information sheet and application form are included in the attachments. If you have a middle school daughter who is good in math and thinks she might want a career in engineering or simply wants to find out more, please have her return the form to the nurse or fax it to 742-4966. It would be a shame to waste this opportunity. I want to remind you of the seriousness of food allergies. I have included an attachment from the National Institute of Allergy and Infectious Diseases. Many scientists believe that the number of people with food allergies is rising, as is the number of foods to which they are allergic. In the past, more often than not, children were only allergic to one or maybe two foods, whereas now it’s very common to see children allergic to two or three or more foods. On the basis of random phone surveys, the Food Asthma and Allergy Network estimate that about 4% of the US population—about 12 million people—are allergic to peanuts, tree nuts, fish or shellfish (www.foodallergy.org). However, there is probably under-reporting. In comments on the US Food & Drug Administration’s 2005 Food Safety Survey, FAAN stated that, “Accurate and reliable data on food allergy and anaphylaxis is lacking, and it is generally believed that the limited data now available represents an under-reporting of food allergy-related reactions and deaths” (FAAN, 2005). The attachment tells you what symptoms to look for and what actions to take. Please take the time to read it. If you have an adolescent with allergies and have not supplied me with an allergy action plan signed by a health care provider and an epinephrine pen, please do so. This week and the following two weeks Steller will be participating in the Leukemia and Lymphoma Society’s (LLS) Pennies for Patients program. LLS is the world’s largest voluntary health organization dedicated to funding blood cancer research and providing education and patient services. Coins will be collected until January 20th for this worthy cause. Collection boxes will be in each AG room and the contents will be counted on a weekly basis. The AG with the most money collected at the end of three weeks will earn a pizza party. However, we must collect a minimum of $250 to qualify for the party. Donations of $1,000 or more will earn the school a gift card of $100. P.S. I am willing to sign off on volunteer hours for students who want to solicit donations from family and friends. Leukemia is a type of cancer that affects the blood and bone marrow. The disease develops when blood cells produced in the bone marrow grow out of control. Leukemia is a broad term covering a spectrum of diseases. In turn, it is part of the even roader group of diseases affecting the blood, bone marrow and lymphoid system, which are all known as hematological neoplasms. In 2000, approximately 256,000 children and adults around the world developed some form of leukemia, and 209,000 died from it. About 90% of all leukemias are diagnosed in adults. About 43,050 people are expected to develop leukemia in 2012. Lymphoma affects the lymphatic system, the network of vessels and nodes that carry infection- fighting white blood cells, called lymphocytes, throughout the body. It ranks as the most common blood cancer and third most common childhood cancer. Lymphomas are generally classified as Hodgkin’s lymphomas (formerly known as Hodgkin’s disease) or non-Hodgkin’s lymphomas. In both types of cancer, the lymphatic cells begin to grow abnormally, producing lymph nodes that are larger than normal. Hodgkin’s lymphoma follows a more predictable pattern than non-Hodgkin’s lymphoma and often has a more limited spread. Non-Hodgkin’s lymphomas are more likely to involve many different areas of the body. Some lymphomas are highly curable (e.g. Hodgkin’s lymphoma, diffuse large B-cell lymphoma) with standard chemotherapy and antibody treatments, which can be given without a hospital stay and are only minimally toxic. Other types of lymphomas can be managed effectively for many years with mild treatments but tend to recur repeatedly with traditional therapies.